GVSU The Meadows *Help the kids discover their passion for First Robotics! Join us for any year at The Meadows at GVSU's course on Friday August 23rd and help the kids discover their passion for First Robotics! Sponsor and Organizer for golf. Here is a sampling of new technology you can expect to see at the show. Broadview Product Development's booth at the Advanced Manufacturing Expo demonstrated the MarkOne 3D Printer by MarkForged, the world's first carbon fiber 3D printer. Externa CGI was founded in 2000 and since that time we have developed into a premier CG studio. We possess technical expertise and a unique ability to thoroughly understand products, processes and services. This allows us to meticulously craft stories through animation and visualization. Since inception, Externa has helped national and local companies tell product and process stories. We employ an array of leading technologies and techniques to create the most engaging and cost effective solutions. Whether VR, still images or a full animated production, Externa maintains focus on your story and how best to tell it. BlueWrist Robot & Vision Solutions presents PreciScan3D, an inline 3D scanning and inspection and guiding solution. It comes equipped with user-friendly software, ScanXtream with automatic feature extraction and defect detection. Asyril's integrated flexible feeding module represents a turn-key solution for the reliable, fast and precise feeding of a near infinite range of bulk parts and components. Comprising an Asycube and a vision system connected to an integrated robot, our feeder and flexible loading modules for small loose parts are ideal for integration on machines or production lines. Self Driving Robots are hitting the factory floor and beyond! Lear how to setup this robot in minutes with your cell phone to bring parts around the plant or haul heavy carts that you don't want your employees getting hurt pushing. See them at AME this year! We have COBOTS!!! Precise Automation with the world’s first collaborative four-axis SCARA and Cartesian robots. Precise Automation’s inherently safe designs provide speeds and accelerations much faster than any other collaborative robot while still limiting forces to ISO collaborative robot standards. Come to booth#502 and see the PF3400 SCARA and the PP100 Cartesian robots move safely faster than any other collaborative robot. Reduces the welder’s exposure to fumes by 90-95%. Consisting of a welding gun with built-in fume extraction, the gun can be connected to a central extraction system or to a stand-alone version without any problems. One advantage of the RoboVent Extractor gun integrated with a RoboVent hi-vac collection system is that it can be used in different workplaces, such as in ships’ holds or tanks. Intended for use in MIG and GMAW welding processes that employ shielding gases. The gun will in all cases deliver an improved performance in comparison to current guns with source suction. Ready for a new logistics paradigm shift reading barcodes? See West Ottawa First Robotics onsite with their robots running around! Here is a video of the season! Support the kids and get golfers to signup for the AME golf fundraiser today! The Grand Rapids Inventors Network (GRIN) is the primary pathway to inventor success by providing a powerful network of resources and education while leveraging collaborative relationships. ichigan Specialty Coatings (aka MSC Floors) is the leading provider of concrete finishing and floor coatings solutions for industrial and commercial markets. From 500 square feet to 1 million square feet we have the manpower and equipment to handle any scale project. For the past 11 years, Michigan Specialty Coatings have been committed to offering their clients the best products and services that will bring function and design to their floors while delivered on time and on budget. Our in-house industrial painting division allows us to provide complete solutions from the floor to the ceilings. 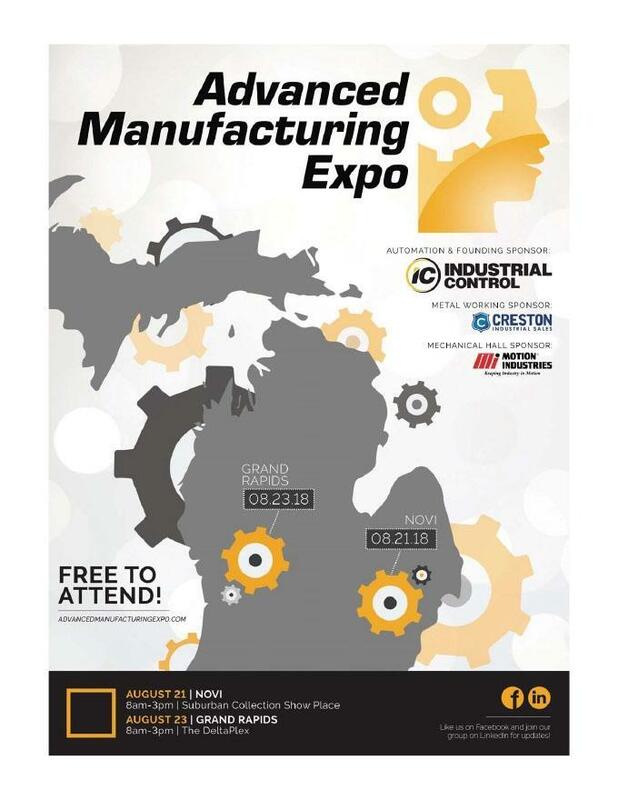 Recognized as the go-to organization for Michigan manufacturers, MMA remains committed to its standing values of trust, leadership, knowledge, influence, and relationship building — all for the continued success of the state’s largest and most vital industry. Established in 1902, MMA now represents the interests and needs of nearly 2,000 member companies, ranging from small manufacturers to the world’s largest and most well-known corporations. Safeguards are essential for protecting workers from preventable injuries. Moving mechanical motion and machine parts have the potential to cause serious workplace injuries. Burns, crushed hands and fingers, amputations, and eye injuries must be prevented. With Husky's Guarding, you receive compliant OSHA and Robotics Industry standard safety product. Contrinex is a leading manufacturer of sensors for factory automation. Your material handling problems are unique. We can help. Specialty material handling projects call for specialty solutions. Tuff Automation is the only source you need for complete, custom automated material handling solutions. RANGERBID.com (A Miedema Asset Management Group Company) offering a new opportunity to sell from any location in the world. Rangerbid.com offers the opportunity to Companies that desire to sell assets to other businesses and end users utilizing our unique marketing system and Rangerbid.com online auction marketing platform.